HOW IS THE TRANSPORTATION ORGANIZED IN FRANCE ? HOW TO COME TO FRANCE ? HOW CAN I REACH MY FINAL DESTINATION FROM CDG AIRPORT ? direct Connection TO TGV South, West and North. The French National Railway is called SNCF. At CDG airport SNCF railway station is located between Terminals 2C, 2D, 2E and 2F. 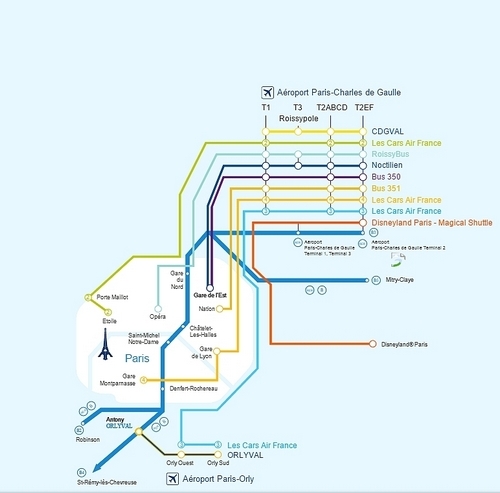 It is served by the free CDGVAL shuttle train (from Terminals 1 and 3), the Aéroports de Paris N1 bus (which stops at Terminals 2A, 2C, 2D, 2 E and 2F) and the Aéroports de Paris N2 bus (which stops at terminal 2G, 2F). All the TGV can’t be caught at the airport. You may have to reach one of the main train stations in Paris. Gare de l’Est station : to reach Eastern destinations as Alsace or Strasbourg. Bercy Station : TER train to reach Burgundy cities like Le Vezelay, Autun. Bus network can facilitate the transport between small cities where trains don’t exist. the Credit Card payment in France is the most common way of payment. You can pay with your Credit Card almost everywhere or be able to withdraw cash easily even in small villages. Hotels in France are rated by a star system, with five-star being the best, palace-like hotels as for example the famous Ritz in Paris, the Martinez In Cannes or the Negresco in Nice. Most of the hotels in France are rated 2 or 3 star comfort. 2 or 3 star hotels are fine and your room should be comfortable with ensuite bathroom. Some hotels offer a half-board option that includes a two-course dinner and breakfast from a reduced choice menu or “plat du jour” at very reasonable prices. Chambres d’Hôtes accommodation (what is called bed and breakfasts in UK or what we call here “Guest Houses”) is a wonderful way to meet the locals. Guest Houses are also rated with “épis system” which are 1,2 or 3“wheat ears” system according the comfort level. Many chambres d’hôtes will also offer a Table d’Hôte—a home cooked meal featuring local produce or specialities. In order to keep the family-like atmosphere the Chambres d’Hôtes are limited to 5 rooms maximum or 15 persons. Gîtes are often apartment or house-like rental, can be found along the Chemins de Saint-Jacques but also in rural or mountain areas, offer dormitory-style accommodation to cater for the large number of walkers (although double rooms are sometimes available). Comfort is generally simple. Mountain huts or “refuges” can be found in mountainous areas only reachable by foot: you will be accommodated in this type of accommodation on you Tour of Mont Blanc circuit or along the GR 10 when there are no other solution. The Mont Blanc circuit offers comfortable huts with all the facilities and provide the dinners and the picnics. In our walking and cycling trips we always mention the type of accommodation whether it is a Hotel, a Guest Houses or a Gîte. Except we express it clearly, all the room reservations offer ensuite bathroom. In a self-guided hiking tour, you are supported but you have to be independent enough to be able to read a map on your own. Rucksack :during the self-guided tour, a small waterproof rucksack (30 to 40 kg) for picnic lunches and all the things of the day that you may need. You may have to take your jacket off once the coolness of the morning is replaced by the sun. Take also an emergency kit with plasters and disinfectant for potential blisters or light wounds. Binoculars (optional) and a Camera;Paper handkerchiefs,tissues Needle, thread and a couple of safety pins. If you choose the option without bag transfer, you will have to travel with the less things as possible in order to carry less than 10 kg on your back. Bring shoes that you have already worn several times, and chosen a half size bigger than your normal shoe size as feet swell while walking. Wear a thin pair of socks covered by a thicker one to prevent friction on the skin and blistering. Don’t forget a pair of comfortable open sandals for the “after-walk” so that your feet can breathe and have a rest ! Aromatic oil massage or essential oil like peppermint can relieve muscle or joint fatigue. Poles help you maintain balance in difficult terrain such as during river crossings, and on slippery ground. They can alsohelp to defend against attacks from dogs, and other wildlife. Swing them overhead to make yourself look bigger or throw them like a spear. Sun protection: in France and above all in Spain and Italy, from Spring to September the sun can be strong : don’t forget to wear sun-glasses, sun-cream and a sunhat. Water : bring a water-bottle: 1.5 to 2 l of water each day : fill it before leaving the hotel. In France tap water can be drunk everywhere in the hotels and houses. In the villages and town if you stumbled upon fountain or other springs beware. “Non potable” means you must not drink this water. For your lunches : Picnic items : Plate or bowl, knife, spoon, plastic box. As you set out each day, remember that most bakeries and groceries close at lunchtime (between 12:00 and 3:00 pm or more). Bakeries are often closed on Sundays afternoon plus one day per week (usually on Mondays). To avoid being caught with no food, buy supplies before you leave town each morning. Most of the hotels or Guest Houses where you will stay can prepare a take away lunch if you order it the day before. Two sets of lightweight, quick-drying clothes hiking pants.